09? no way, its still a test mule, which means its far from being finished. It would have to be out in Germany by end of this year for us to see it in 09. My Ride: Living in Germany as an expat, this is the perfect opportunity to own the car of my dreams. I bought a new BMW E560 Individual in April 2007 and I have been in love with my M5 ever since! Where else can you experience the acceleration, speed and fabulous performance of this wonderful German engineering, but on the German Autobahns (almost with immunity for high speed as long as you slow down when there are limits). Fastest so far has been 293kmph (183 mph) but my M5 has much more left...I will get it to the limit of 330kmph (205mph) or more yet! Problem is it makes me want to drive everywhere possible at any oppotunity and I am rackng up the kilometers! Take a look at the attached BMW Roadmap I found on this forum in the gallery (I think). It indicated the F10 will be released at beginning of 2009. 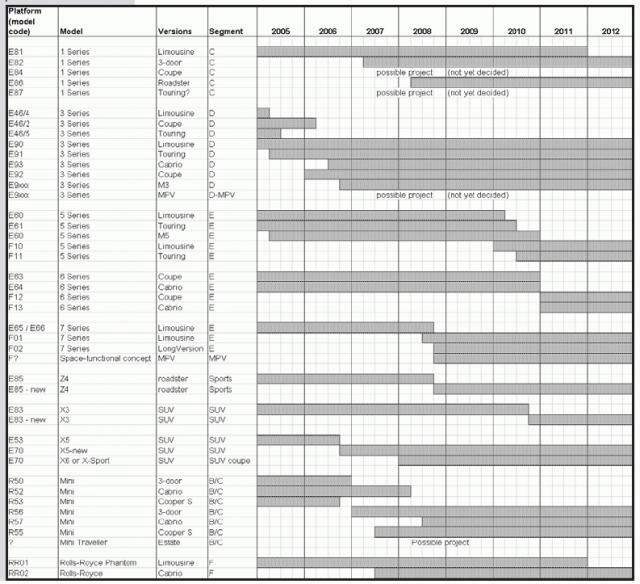 This BMW Roadmap seems accurate as all the release of other models shown are spot on. E90 and X6 releases in Germany anyway have been exactly as shown in the roadmap. There for it would seem that the E60 limousine (sedan) has only a little more than 22 months left in it's life. E61 has an additional 6 months and new M5 will be later than than that (not shown in roadmap), but M560 shown a life until the end of 2010. Hope this solves some of the mystery. Take a look at the attached BMW Roadmap I found on this forum in the gallery (I think). It indicated the F10 will be released at beginning of 2009. Ummm...according to THAT chart, the F10 starts at the beginning of 2010, not 2009. It also seems that the E60 Sedan would continue production in overlap through the 1st quarter of 2010 before completely ending. ....which incidentally, is the same way it happened with the E39>E60 and E46>E90. They were built side-by-side for a little while.